This week I was able to finish my Star Fusion Quilt. This was started at a class during the Road to California Quilt Show in January. The pattern is by Janna Thomas and uses the Bloc Loc Rulers. If you have not tried these rulers, they are worth checking out. The website has a video on how to use them. They are great for squaring up those half square triangle blocks, flying geese, and many other blocks. My Star Fusion is made a bit smaller (42 x 56) than the original Twin size, and I used black and white fabrics as the accents. I really like how it turned out. This is also my #4 UFO for March and it is done! Now on to something else-check out my Design Wall tomorrow to see what I will be working on for March. Here are the updated numbers for this week and I am finally out of the red! Used this week: 6.5 yards. Purchased Year to date: 29.75 yards. I love the way your Star Fusion turned out. Can't wait to get mine going again. I saw Shelly today and she mentioned having been to your blog...she is real excited too to get one going of her own. YEAH OUT OF THE RED!!!!! Oh, Kerry, that Star Fusion is STUNING!!! Wow! 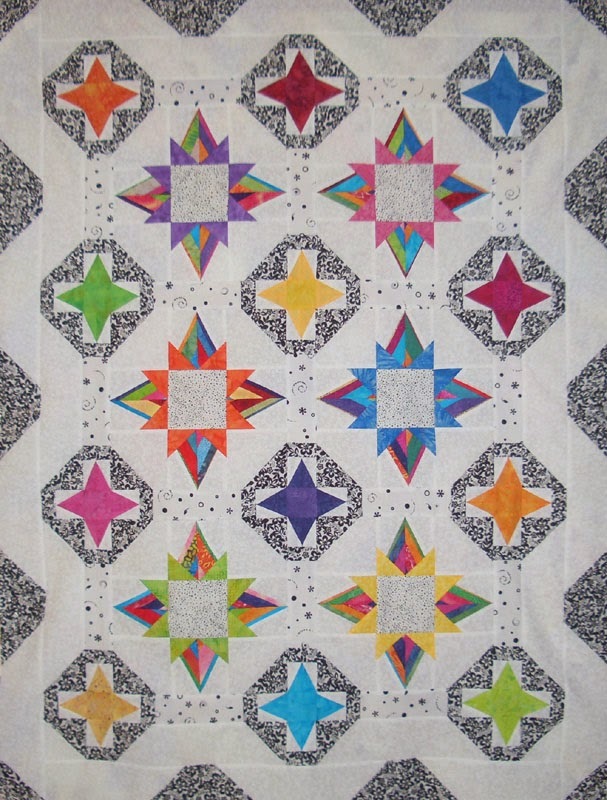 Wonderful quilt, I love the way the colour really pops against the black and white. Well done! Hello from Marty's blog. :) This is so pretty! I really, really like the black and white fabrics for it.